Watercolours by Sir Miles Warren, from Miles Warren: An Autobiography (2008), courtesy Canterbury University Press. 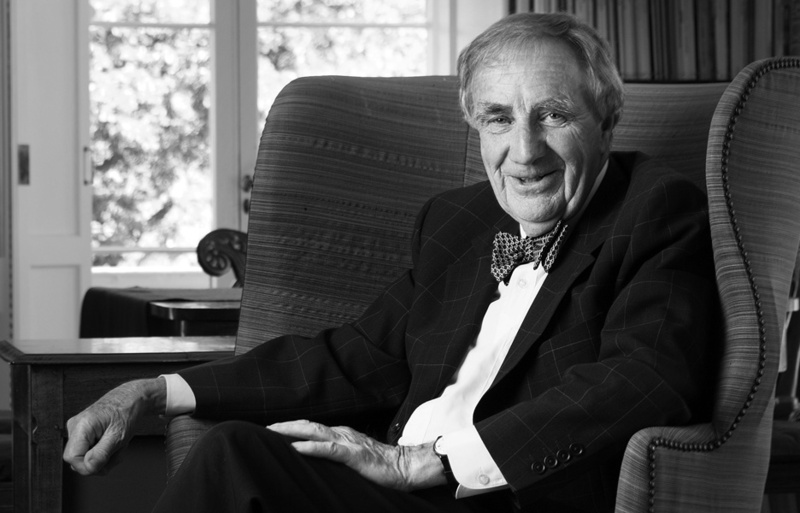 Photography courtesy Warren and Mahoney, except Sir Miles portrait by Stephen Goodenough. Simon Sellars: Perhaps we could start with the quake and its aftermath. What is the biggest challenge facing the reconstruction effort? Sir Miles Warren: The biggest challenge is resolving insurance questions. You can’t get a loan until you’ve got earthquake insurance. And the reinsurers are clearly reluctant to provide earthquake insurance until there’s no prospect of any further major quakes. We were very fortunate to get going at Ohinetahi [Sir Miles’ historic home in Governors Bay] after the first earthquake, because at that stage it was thought it would be one event. 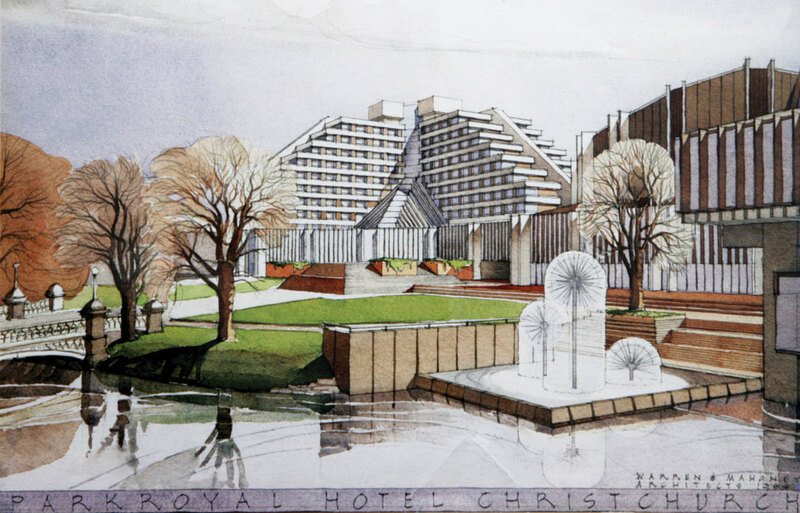 SS: I read an interview where you say you’ve been lying in bed dreaming of redesigning Christchurch in your head. How far have you got? SS: Is there a word to describe it? MW: It’s a building type. Well, something that really develops into a building type. The Institute of Architects has made that proposal to the City Council, but so far it seems to have dropped like a lead balloon. In my mind, I’ve always said that instead of all these – what’s the right word, ‘aspiring’; no, ‘grand proposals’ – it would be far better for the Council to establish green bases around which housing can be built to the east and the south of Christchurch. SS: Isn’t that what the Central City Plan aspires to – a ‘garden city’ model? 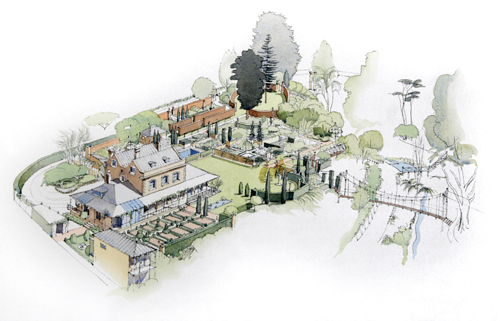 MW: Well, it’s easy to talk about garden cities, but to actually achieve them is something else. In Christchurch, the riverbank – the river from the hospital through to Victoria Square – is one of the best, what you might call, ‘river parks’ anywhere in the world. It really is superb: a combination of riverbank, stream, small river, tree planting over the years and a succession of quite interesting buildings, one from each period. But as usual we want to tinker with that, when we should be leaving it alone and concentrating on the south and the east. SS: How have Warren and Mahoney buildings fared post-quake? MW: We had at least 15 office buildings, but now, apart from the Parkroyal Hotel [now the Crowne Plaza, and confirmed for demolition] and the Forsyth Barr building, I don’t know what’s going to happen to any of them. College House is all there – the sets have all stood and, surprisingly, the chapel. But the ground has moved under the dining hall. That is going to be a challenge. The Parkroyal, by the way, is a disaster. It has two wings and for some reason, no one knows quite why, the piling on one section on one wing was different. And there’s this drop. But the engineers say they can lift it all up. They did a lot of work on it. But unfortunately the building is out of vertical. There’s no way the whole building can be brought back. And the Town Hall is down on one side with the screw piles and so on. We’re getting very good at screw piles! SS: The CBD’s in limbo, isn’t it? No one knows what’s going to be pulled down or redeveloped. SS: In the paper, someone was saying there’s too much testosterone in the rebuilding process. They’re just getting in there, swinging the crane around, knocking down buildings. MW: The demolition guys are doing extraordinarily well. They’re making a fortune, while the building trade… well, there’s simply no work. SS: I spoke to someone in Christchurch who was frustrated because it’s a year on since the quake and nothing has been done. He compared that to the Brisbane floods, where rebuilding commenced soon after the disaster. MW: It’s not comparable to the Brisbane floods, because we don’t know whether we are to have another earthquake. And it wasn’t just the one. I mean if it was one thing, then you’d know exactly where you were, but we’ve had three and we still don’t know precisely where we are. I mean only yesterday, despite all the work done here, at Ohinetahi, we got a note to say we still haven’t actually got ground clearance yet. It’s easy to be critical of the EQC [Earthquake Commission New Zealand], but they have had to engage another, I think, 800 people, many of them Australians, to come over and assess buildings here. Some were expert, but many really had no qualifications to do it. Imagine trying to employ that number of people. A nephew of mine got an envelope from the EQC a year after the earthquake to say that his house was so damaged it had to come down, and then later another letter to say it could be restored! People have reported they’ve had nine EQC inspectors come around to the point where they’re saying, ‘Please God, won’t you leave us alone?’. So, we plod on. SS: There are still aftershocks going on from the first quake, aren’t there? SS: I understand you were home at Ohinetahi when the first quake happened. Looking around, I can certainly see the extent of the damage here. Could you give me your impressions of what happened that night? MW: Well, I woke. The dog beside me moved first, and then there was this shattering roar. I knew this was certainly an earthquake. And I got out of bed and clung to the end of the bedpost as it shook my bed. When it stopped, I then walked down the stairs, with a shower of plaster falling down, into the hall, where I tripped over the grandfather clock. Then into the library, weaving through the library; I was heading to get my torch, being splendidly well prepared! I finally went through the study into the cloakroom where the torch was, stretched to pick it up and walked out, unaware that above me there was a gaping hole in the roof with huge rocks lying either side of me. I got outside and there were my neighbours, who had come down, knowing this building was likely to suffer. What had happened was that four gables had collapsed onto the single storey ones. Well, then we had three days. All the buildings in Christchurch were classified pretty quickly with ‘red’, ‘green’, ‘orange’ or ‘white’ codes, but nobody came over to Governors Bay. Looking back on it, I realise it was a very considerable risk, but nevertheless 10 people – family and friends and so on – came over to help, and we got all the art out to the art gallery, and then the next stage was small furniture into the double garage, and then the rest into the ground relocations. Eighty-two boxes of books – it nearly killed me. The possessions were more valuable than the house! SS: How did you approach the house’s redesign? MW: Well, we’d hoped to keep up one corner to the full height. There was that tall stone block, which was the substance of it – it had a commanding presence in the garden. I mean, architecturally, you could say it was really oddball, to say the least, but it did have a weight in proportion to the garden. To lose it was a great pity. We had hoped to retain half of that elevation, but in the February earthquake that all came down. If we hadn’t actually begun strengthening after the first earthquake, the February event would have bowled the whole thing down. So we were lucky there, in a sense. SS: What were some of the difficulties involved with reconstructing the house? MW: We actually tied and strengthened the top floor, and if we hadn’t done that, the whole of the north wall would have bowed out. But then we had the very great good fortune that one of the largest builders in the city, Andrew McGregor, lives in Governors Bay. He drove over and said, ‘Do you want any help?’ and I said, ‘Yes, now!’ And they’ve been here ever since. I mean, I wasn’t going to worry about it – I knew we were insured – but all the elaborate processes had started and this meant I could afford to get on with it. Then we had a very lucky break with the City Council. To alter or amend a heritage building requires a resource consent. Inevitably, with the Historic Places Trust, that is quite a long process. It can take months. We were one of five heritage buildings considered by the Council as a ‘pressing need’. The techniques and processes are difficult, especially with an oddball thing like this where so much had changed. But we got cracking and we only got retrospective resource consent, so we’re one of the few buildings that the insurance company says they’ve paid out. Although they have thousands of claims, they’ve only resolved a hundred or so. There are all sorts of complications: was it one event or three? SS: Technically, the second quake was an aftershock from the first. Well, the EQC has declared that there are three events, so they’ve paid out three times. Now, whether the insurance companies or the reinsurance companies agree about that is another matter. It’s all very, very complicated. I know something about the trade, but you can imagine how older people must feel, with their large, old brick houses crumbling about them and not knowing what to do or where to go. SS: It’s a confusing time for everyone, especially given the unexpected force of the quake. From what I’ve heard, it was just phenomenal. MW: In February, I was with my sister on the seventh floor of a block of apartments in the city. And the movement was vertical. You realise that the buildings rose – they rose! And, as they fell down, they came down at the weight of two-and-a-half times that of gravity. The whole weight of the building came down as the next shock came up. But fortunately the key buildings in Christchurch – the Arts Centre, the Museum – had been well strengthened. SS: Was it like a concertina effect? MW: Well, you imagine it would be. We walked down the stairs and there we were, standing in the street, and I looked across the way at an office building I was involved with. They were all standing around, but it wasn’t until we got around to Castle Street that people started coming out who were obviously hurt. The first thing I did was walk around the river to Christ’s College, because I’m proud to say that back in the late 60s, early 70s, I bullied the college: ‘You must start earthquake-strengthening your buildings.’ Most people excused themselves that they couldn’t afford it, but the college was very well endowed. They had three-storey brick-and-stone buildings and I said, ‘If that building collapses, and 50 small boys are interred within it, then you, the board, will be responsible, if not legally then morally.’ And that started the whole steady process of strengthening. The dining hall of the building along Rolleston Avenue is a superb piece of neo-Gothic architecture by Cecil Ward, one of the best architects in New Zealand. Anyway, it was most ingeniously strengthened. We built a stiff box at one end, the administration building, all faced with stone and so on, and dragged this building onto it. And it all stood. There is work to be done but the school is operating. There it is. I then walked to the Arts Centre. They had one corner block strengthened at $1 million, and it has stood very well, but there is a tremendous lot more to do on it. Now, that is a building well worth strengthening, but it’s going to cost time and millions. SS: What else is worth rebuilding or strengthening? MW: The Provincial Chambers, the only provincial buildings left in New Zealand. It had a splendid main hall in stone and then brick portions with two stone blocks, which were partially there to prevent fire. Now, one of the towers has collapsed. All of the wood is perfectly right but the main, splendid corner building is completely gone. That’s a building of national importance and I’m sure it will eventually be rebuilt, as will the cathedral, which I’ve been involved with in the past. 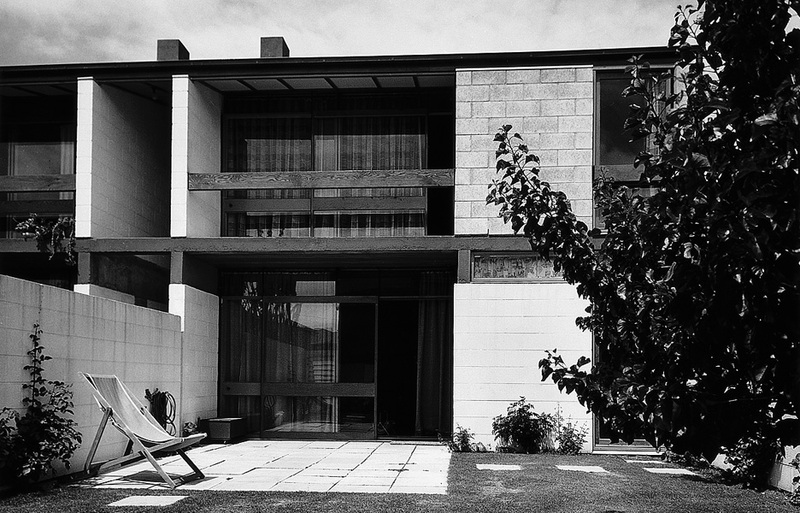 SS: In an essay by Paul Walker on Warren and Mahoney, he wrote, ‘In the sixties Christchurch architecture attained a mythical status.’ Do you agree with that assessment? What part do you think you played in that? MW: Yes, well, I think it’s rather grandiloquent! No, it’s really a matter of timing and where everyone went to and so on. I worked at the LCC, the London County Council, on Roehampton Lane and blocks of flats and so on. 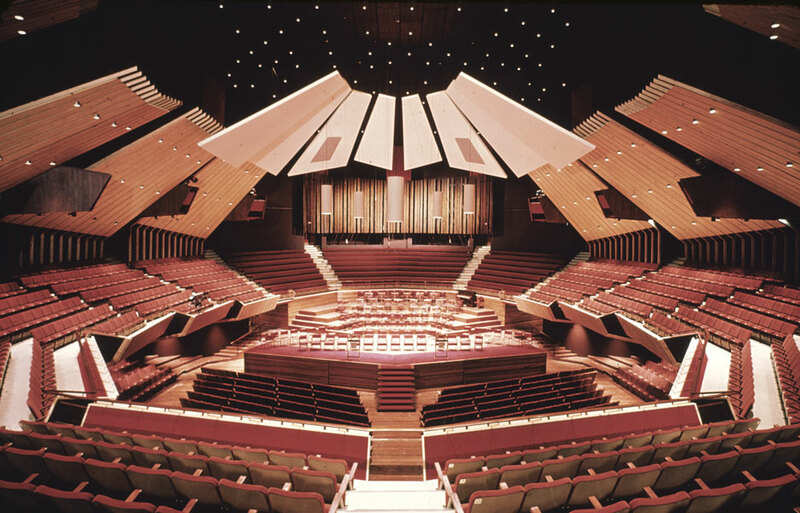 I was really there at the beginning of what is now rather unfortunately called brutalism, and I introduced it to Christchurch. SS: Was that a challenge? Was there resistance? MW: No. We were really extraordinarily lucky. There was simply a hell of a lot to do. We simply got on with it, and it was a time when we built buildings for the people who were going to own them, not developers. We dealt with the manager, or what were called the CEOs then, and the general manager or the owner of the building. And you produced the drawings and they said, ‘Yes, we’ll go ahead with that.’ For a brief period, it was very profitable. We just built a hell of a lot, and built quickly. But nowadays, there’s a tangle of rules and regulations and permits and God knows what. Back then, no one was so vulgar as to mention the fees! Truly. Now, that’s the first thing talked about. I mean you never went to your solicitor and said, ‘What do you charge per hour?’ It’s just our costs at the bottom. SS: So, what did brutalism or, rather, modernism mean to you? What was your attraction to modernist thought? MW: Well, technically it was the use of building materials and ways of exposing them. 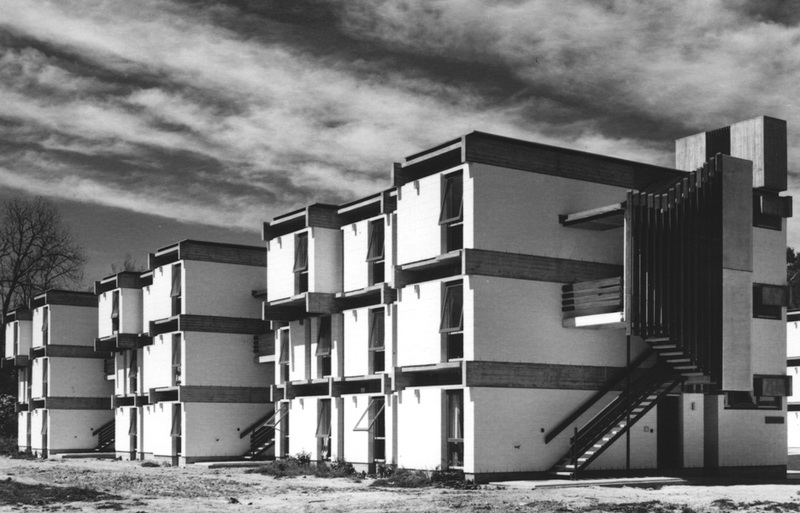 I mean, I think of all the awful motels that have been built over the years with concrete block. But with the block of flats we built in Dorset Street, the key thing was that instead of normal plaster walls and ceiling and soft finishes and wallpaper and paint and so on, here were concrete block walls, concrete beams and timber ceilings. It was the use of different materials and whole different building techniques. We adopted a whole new vocabulary of materials, including how they were built and exposed. Whilst College House was being built using concrete block and fair face concrete, at the same time we were building the Student Union Building in pre-cast concrete, post-tensioned – a very elegant, light structure. It was the emphasis, I suppose, on how a building was made and then demonstrating it. That led to a whole series of office buildings in the city, without air-conditioning in those days, which was thought to be very expensive and extravagant. In the days when offices had lino on the floor, only the boss might have had carpet. And there was a requirement for windows and the view. We set the glass back and allowed the pre-cast concrete elements to shade the face, and that produced these articulated fronts. It was in complete contrast to the glass front and I hope some remain. But that whole process of brutalism goes past 1965, and the culmination of it is College House. SS: How has Dorset Street stood up post-quake? MW: CERA [the Canterbury Earthquake Recovery Authority] has proposed to demolish the flats; they have the authority to demolish left, right and centre. But I had a meeting with the Historic Places Trust and their expert engineer, and we believe the building can be strengthened without diminishing its architectural importance. SS: Something that really struck me regarding the plans to reconstruct Christchurch is that it’s rare to see an architect’s name mentioned. MW: No. This is extraordinary. I was first advised only two weeks ago of plans for the Town Hall and that was by the engineers, not the owners of the building. When you think of it, with those buildings, the actual structural costs vary from 35 to 40 per cent. The rest is architecture. What’s so sad is the only architectural content that has been brought into this new scheme is a Danish firm of architects. Well, they are very able architects, but Denmark is very different from New Zealand. Architects are being brought in for individual buildings now, at long last. But in terms of the overall plan? SS: Architects can have a say in designing cityscapes, as well. MW: Of course they can. I mean, we build the damn things! Unfortunately, it’s in the hands of planners who are two-dimensional people. They only think in terms of rules and regulations. They have a vision of it and then try and put regulations around which produce it, but regulations do not produce architecture. Within regulations you can build a stinker or it can be well done. It tries to encapsulate that particular view at this particular time, but in 10 years’ time things could be quite different. SS: You’ve spoken a bit about developers and the emphasis on costs as a significant difference between when you practised and now. What are some other points of divergence? SS: You mentioned that when Warren and Mahoney began, briefs were comically minimal. SS: In Australia, there has been some talk about a crisis in the architectural profession. What is the situation in New Zealand? MW: Well, there are many, many more architects. I mean, it astonishes me how many architects there are now in Christchurch. But the real crisis is that their fees keep dropping and the costs keep rising, so that we’re now the poorest-paid profession. The engineers charge a fortune, $290 an hour, so they’re earning, I’d say, twice what an architect does. We’re at the bottom of the trade, the bottom of the professions, and lumbered with more and more responsibilities. The sad thing is there’s extraordinarily good work being done; I mean the amount of detail and attention and care and so on. Another thing is the introduction of project managers between the architect and the owner, and the developers in the same scene. No one was so vulgar as to mention costs at Christ’s College. Today, you haven’t got a great relationship with the people who are going to actually occupy the building. You’re just part of a package. And the first duty of a project manager is, of course, to squeeze the architect’s fees. One of my proudest moments was to sack the project manager from the rebuilding of Parliament and deal directly with the client’s representative – an architect!